Two days before the Spring Equinox and the country was again blanketed in snow. Worst hit was the East coast and the South West so the journey up to Lancashire was not as bad as it might have been. Saints fans arrived in Wigan in droves and gave strong vocal support throughout. Gabbi and Boufal were back for Saints with the Italian supporting our central striker. Wilson and Keown were the BBC commentary team and the match was NOT subject to VAR. This was either because Mr Oliver is one of the best referees or Wigan's ground lacks the necessary technology. Wigan kicked off towards the bank of away fans. They wore their blue & white kit and Saints were in the turquoise and black away strip. Wigan looked lively from the off and the giant Burn wasted no time in dumping both out forwards on their arses. Wigan were passing very nicely and seemed to cut through Saints at will. PEH made the odd tackle, but on 5 minutes Lemina conceded the first of umpteen Wigan corners. Thankfully most of these were rubbish. Within moments of each other, both Gabbi and Grigg ran behind defenders and both were flagged offside. Saints first serious attack on 7m ground to a halt when Carrillo fouled his marker. On 11m it was Carrillo who was fouled by Dunkley. Saints put the ball into the box and the keeper dropped it: as Carrillo tried to sort his feet out, Walton recovered and smothered the ball. Anyone hoping Walton would turn out dodgy was unlucky: he got better and better as the match progressed. Will Grigg made Hoedt look extremely ponderous, turning the defender and breaking into the box. The back-tracking Lemina blocked him for a corner which McCarthy punched away. Wigan then enjoyed plenty of possession, creating half chances but only gaining a string of corner kicks. Saints finally got the ball back when Burn's header was collected by McCarthy. Saints had a rare foray forward with Cédric's right wing cross reaching Boufal who swung wildly and volleyed it high over the top. Then Tadić picked out Lemina who curled his shot rather closer but still over the bar. Boufal then carried the ball forward before setting up Lemina. This time his shot was on target but Walton saved. This brief period in the other half ended on 19m when Wigan broke forward. Grigg knocked the ball down to Roberts who snatched his shot and skied it into the ranks of Saints fans behind the goal. Saints were guilty of misplaced passes which Wigan eagerly jumped upon. Only a timely block by Stephens prevented a shot at goal. Moments later Boufal conceded Wigan's 6th corner. Cédric immediately conceded a 7th. From this Saints were able to break upfield through Boufal. His run and pass found Carrillo who failed to control the ball and Wigan won it back. On 27m a lovely Wigan move sent Power clear but, his cross was too near McCarthy who gratefully collected. Shortly afterwards Boufal conceded an 8th corner which Power wasted by bending his cross out of play! On 30m a foul on Bertie enabled Tadić to put the ball into Wigan's box. It very nearly fell nicely for PEH but, as he waited for it to drop, a Wigan boot sent it away from their goal. Another fabulous cross by Boufal on 32m found Gabbi offside. On 34m Lemina brought the awkward Roberts down. McCarthy again came and punched the resulting free kick away allowing Saints to break. Boufal went on another mazy run, reaching Wigan's box before weight of numbers saw him lose possession. It was suddenly end to end: on 36m, Wigan's forwards were queuing up to score but, when the final shot was blocked, Tadić went upfield to find Gabbi who shot wide. Wigan remained confident and were giving at least as good as they got. Thankfully, Hoedt was now doing better in his battles with Grigg and the scourge of Man City was not getting clear scoring chances. 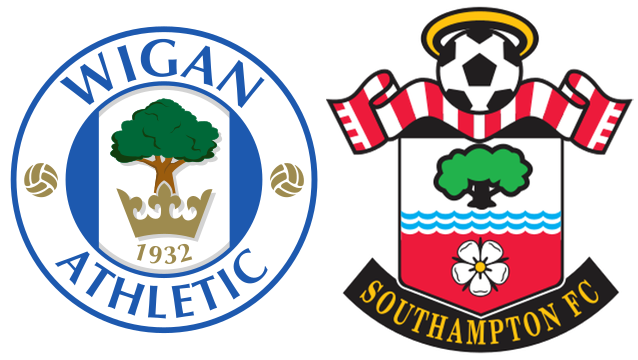 Another string of Wigan corners saw Power and McCarthy resume their duel, with the Saints stopper holding onto the final cross. With half-time approaching Boufal tried his luck down the right, sending in a perfect cross for Gabbi. Sadly, Carrillo got in the way and ruined another Saints attack. Wigan went right down the other end and Jacobs' dangerous cross went past Grigg when it seemed the striker must score. Tadić was about to launch another attack when Mr Oliver's whistle went for half time: 0-0 and all to play for. Half time saw the BBC pundits (apart from Franny) bemoaning Wigan's failure to score but we were then treated to Mick Channon reminiscing about 1976. When Stokes stuck it away, Franny supposedly punched the studio air. Saints were now kicking towards their own fans and it seemed Mark Hughes had "inspired" them during the interval. The passing was crisper and more accurate and the ball was played forward with greater urgency. Wigan were now being pushed back and it was no surprise when Massey had to clog Boufal to arrest his progress. Saints pressure had no immediate reward with Walton finally claiming the ball. Saints next attack was halted by PEH's foul on Roberts. On 52m Wigan attacked, winning yet another corner. Hoedt headed Power's cross away but back came the home side with Jacobs shooting wide. Wigan's next attack enabled Massey to shoot but he too missed the target. Boufal was looking the most likely to create for Saints and Dunkley did well to clear his super cross on 56m. The next attack saw Boufal upended as he neared Wigan's box. He struck the free kick himself but the shot curled over the bar. On 58m Wigan almost gifted us a goal. Byrne had been a menace getting down their right but, under pressure, his aimless back pass eluded team-mates and landed at the feet of Gabbi. Walton's sprint from his line forced the Italian to shoot early but last season he'd have buried it. The keeper made a good save, sending the ball out for a corner. The overhit corner reached Boufal. His return ball was headed harmlessly into the air by Carrillo enabling Wigan's keeper to collect. Saints were dominating the ball now and Højbjerg was able to join the attack. On 60m he was fouled allowing another ball to be swung into Wigan's box. In the 1st half Wigan's big defenders had easily headed crosses away but it was noticeable that they were now being matched up by Stephens and Hoedt. Deeper crosses and smart movement allowed others to get on the end of them. When a Bertie cross was put out for a corner on 64m this ploy worked like a dream. Carrillo's near post run left Højbjerg unmarked and the Dane's firm header was pushed over by Walton. Tadić repeated the cross with the next corner. With the big guys pinned and Carrillo dragging defenders away, PEH was able to meet the cross closer to the goal and turn it past the bodies on the line: 65m and Saints 1-0 up. Both Managers had subs warning up and 3 were introduced before the restart: Paul Cook sent on Powell and Colclough for Roberts and Massey: Hughes replaced Boufal with Redmond. Last Friday I read in one of the tabloids that Redmond would be Hughes' main man – so I was surprised when he didn't start. I don't think I'd be exaggerating to suggest he achieved more in this 30m than he had in all previous appearances this season. Redmond initially went down the right wing with Tadić on the left. He got a couple of crosses in which were headed out. It would be wrong to suggest Wigan were out of contention as Powell looked a good player: Bertie was obliged to foul him as Wigan sought to get forward. Saints were playing the better football (at last) and our fans were providing great vocal support. Then, on 72m, a lovely through-ball sent Gabbi scurrying into the box. Burn's tackle from behind sent him sprawling and the Ref indicated penalty and booked the defender. Without JWP or Charlie on the park I'm never confident about penalties. Gabbi took it – he certainly needed a goal – and he hit it well enough. Sadly for him, and us, Walton guessed right, got a firm hand on the ball and sent it wide for a corner. I was concerned that none of the Italian's team mates commiserated with him. He looked gutted. The first corner was cleared but Saints soon won another. This too fell to PEH but this time his shot flew over the bar. Saints reduced the corner kick arrears without creating another clear chance. Stephens did get to one but his header went way over. Then Wigan got forward and won a corner off Hoedt. Power's cross dropped into our box but Stephens reacted quickest, hacking it clear. Wigan enjoyed another period of possession but when Poer's cross came in, McCarthy was on it in a flash. Bertie cleared the next attack but was then guilty of bringing down Byrne. Before the free kick was taken, the full back was replaced by Noel Hunt. Saints brought on Long for the struggling Carrillo. Stephen's cleared Powell's kick but back came Wigan, with Hunt winning a corner off Lemina. From the corner, Saints broke upfield and Dunkley was yellow carded for hauling back Long. On 87m the same defender fouled Long again but no further sanction came. Saints then brought on Romeu for Gabbi. Martin Keown (never known to say anything positive about Saints) handed BBC's MoM to Walton who had indeed pulled off some great saves. Indeed, Wigan were still in this match and Powell in particular showed nice touches driving the home side forward. As 4 added minutes was signalled, Hoedt rose to head the corner kick away. Saints found Redmond who lost his marker and broke upfield. With Wigan's big defenders stranded, Saints had runners everywhere and then Saints got that bit of luck needed for an extended cup run. Redmond saw a team-mate in space on the right wing and tried to find him. Instead, the ball struck a defender and fell into the path of Cédric in the inside left position. A deft header saw him past the last defender and, as Walton tried to narrow the angle, Cédric opened his body and curled a right-footed shot inside the far post: 2-0 and game over. The remainder of added time passed without significant incident and Saints marched to a Wembley semi-final with Chelsea. Mark Hughes seemed pleased with his first match as manager of Saints. His bravery in playing 2 strikers had not been directly rewarded with Carrillo having a 'mare and Gabbi missing some sitters. However, indirectly his attacking intent was rewarded as, particularly after half-time, Saints seemed eager to get forward in numbers. It is significant that international players, a defensive midfielder and a full back, both scored their first goals for Saints this afternoon. When your strikers are low on confidence, others need to shoulder the responsibility for scoring. Last Sunday was a great example of this happening for Saints. Can anyone have seen this happening under MoPe? Thought not. The BBC gave it to Wigan's keeper who did indeed bring off several great saves. However, our midfield deserve credit, after a distinctly below par first half, for the way they seized the game and put the League 1 side onto the back foot. I'm giving it to Piere-Emile Højbjerg, as he also provided a threat going forwards and scored the decisive goal when the match could have gone either way.